We’ve spoken about this garden speaker before and there’s a reason for that. 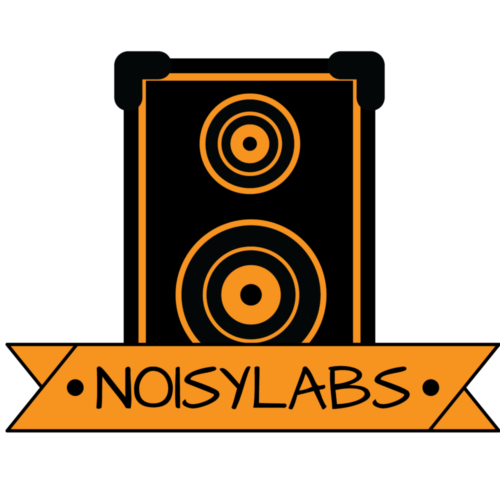 Excluding the specific speaker for now, let’s talk about the brand, Niles. Niles is known for great outdoor speakers. They also provide garden satellite speakers and in-ground subwoofers. The custom Niles Audio GS4 is one of their best products. Some of the features include a 4-inch mineral-filled Polypropylene woofer. The combination of speaker material and sound quality provides audiences with long-lasting quality speakers. 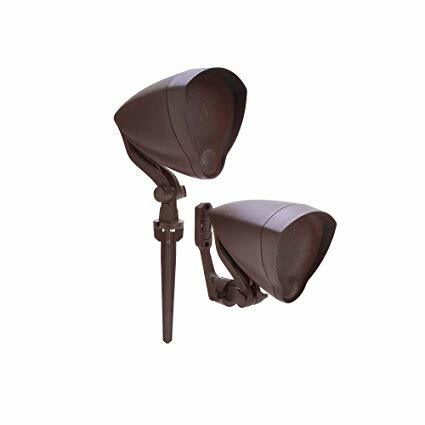 The duration of these garden speakers is also an attribute to the weatherproof design. Remember, it’s important to distinguish between waterproof and water-resistance. As for this speaker, it leans more towards waterproof because it can stand being drenched in water. In addition to their waterproof capabilities, they also fit military anti-corrosion specifications. Although we don’t want to get into specifics on what is considered military anti-corrosion specific, just know whatever item is held to this standard is meant to be very reliable. Imagine aircrafts, tanks, and ships being used everyday. The military puts those vehicles through a lot and making them corrosion-resistant is a smart investment. If a speaker can resist corrosion like military vehicles then consider it an asset. This garden speaker is similar to our first recommendation in terms of looks. 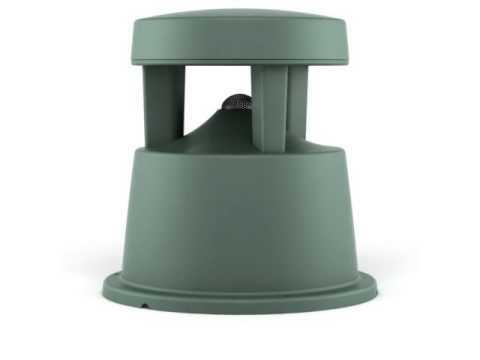 What’s different is this top garden speaker contains a 1-inch aluminum dome tweeter. Although it isn’t an omnidirectional speaker, its design allows it to cover a wide area making it perfect for backyard parties and barbeques. The best parts of this top garden speaker is all thanks to their Tractix horn. 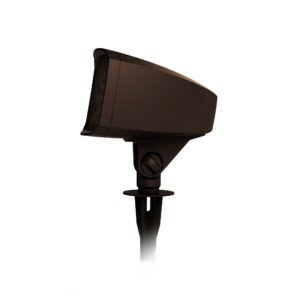 It covers a wide area because the Tractix horn provides an ultra-wide 105-degree horizontal dispersion. This dispersion makes any (as long as you’re in front of it) listening experience enjoyable. We failed to mention anything about flexibility with our first recommendation. Maximum flexibility is the name of the game for this music speaker. And the reason why it’s versatile is due to both 18-inch and 10-inch ground stake options. Its mount installation kit is strong and can fit in residential or commercial areas. If you’re looking for a multi-dimensional garden speaker then this one is right up your alley. 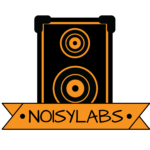 If you’re a consistent reader for noisylabs then you should expect seeing the same speakers over and over. With the Bose Free Space 51, we’ve mentioned it in 2-3 different articles. The most recent article we’ve featured it in? The 360-degree sound coverage makes it a true omnidirectional speaker. What’s great about an omnidirectional speaker is everyone in the area can enjoy. Besides, there’s no need to always stand in front of a speaker because if you’re in the general area, then you’re already in front of it. To provide a great frequency range for sound richness, the Bose Free Space 51 has a central port and a domed grille. The central port gives more juice to make low-frequencies sound better and a domed grille enhances the high-frequency tones. As for installation, its design is meant to make it easy to blend in 2 different environments. The first environment it looks great in is your garden. With its green color, it’ll be easy to walk by it and not notice it’s there. Another great place for your speaker is your patio. There are grooves on the base which make it easy to hide wires under it. Nonetheless, wherever you put it doesn’t matter as much because we’re positive it’ll look great wherever. Also, don’t worry about its durability. Its construction has been tested from temperatures of -22-degrees Fahrenheit all the way to 140-degrees Fahrenheit. If there’s one speaker meant for year-round use then this is the one. Aside from its durability, versatility, and sound richness, there are many features we could go on and on about but it would seem like Bose sponsored us (we’re open to any deals Bose!). 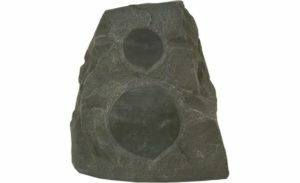 The popular version of this outdoor garden speaker is the sandstone one. But if we’re being honest, that one won’t blend in as well as the granite version. A major part of what we’re doing with this post is to recommend speakers which camouflage well in your garden. A bright speaker will stick out like a sore thumb. You want your landscape to look smooth. Attention to details when it comes to speaker design and placement is crucial to optimize outdoor garden speakers. One of the stand-out features of the Klipsch AWR-650 is its durable UV-resistant enclosure. This works well against corrosion. Similar to the Bose speaker above this, this speaker is backed by a reputable brand (Klipsch). The company has over 6 decades of experience which means they’ve slowly evolved their product to meet customer’s needs. One of the ways they meet customer’s needs is by providing a 2-way design for quality sound. In terms of quality, we’d put this one up there and we also think it’s comparable to the Bose speaker above. This Bluetooth garden speaker has long-range Bluetooth technology which we mention because all these other speakers never mention Bluetooth. One complaint users have is it only connects up to 20-40 feet. It’s common for long-range Bluetooth outdoor speakers to connect up to 100 feet. An advantage with this speaker is their sound frequency is great at all ranges. From the lowest of lows to mid and high-level sounds, Sound Appeal brought in an excellent engineering team to construct the perfect dynamics for sound. Comparing its durability to the other speakers here, we’d say, it’s right on line. Considering it’s an outdoor speaker, rain, snow, or heat won’t deter you from playing this at your parties. In addition, the speaker has a great price point. 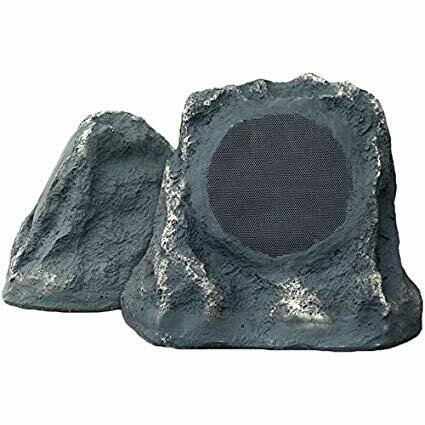 Anyone looking to start out with a garden speaker will find this one affordable and easy to set up. Looking at the design there’s no doubt it will fit in great with any landscape. The color of grey is a versatile color and assuming you put it in your garden, there’s no way it won’t fit in aesthetically.